LEARN JIU JITSU FROM A TRUE BRAZILIAN 4TH DEGREE BLACK BELT at AUCKLAND HQ. If you are looking for BJJ classes in and around Auckland, New Zealand you are in the right place. Douglas Santos is the first Brazilian Jiu Jitsu Black Belt to arrive in NZ back in the year 2000. 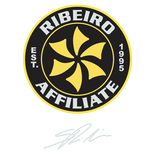 Since then, he’s been running successfully his BJJ club teaching students of all ages (both men and women) the art of Ribeiro Jiu-Jitsu/Brazilian Jiu Jitsu. Most classes are taught using the Gi, except for the ones specifically focused on Self Defence. The club has its headquarters located very close to the heart of Auckland City CBD, which makes it very convenient. Plus other clubs around Auckland and New Zealand. It’s a friendly place and you are most welcome to come and try a free lesson before making up your mind. If you’ve been thinking about starting a martial art, or if you want to get in the best shape of your life while having a lot of fun in a safe environment, don’t wait any longer. Adults, kids, men and women are all welcome. Douglas Santos (3rd Degree Black Belt) is on the mats everyday living the BJJ lifestyle and dedicated to his students 100%.OSS! COME VISIT US IN Auckland - New Zealand!